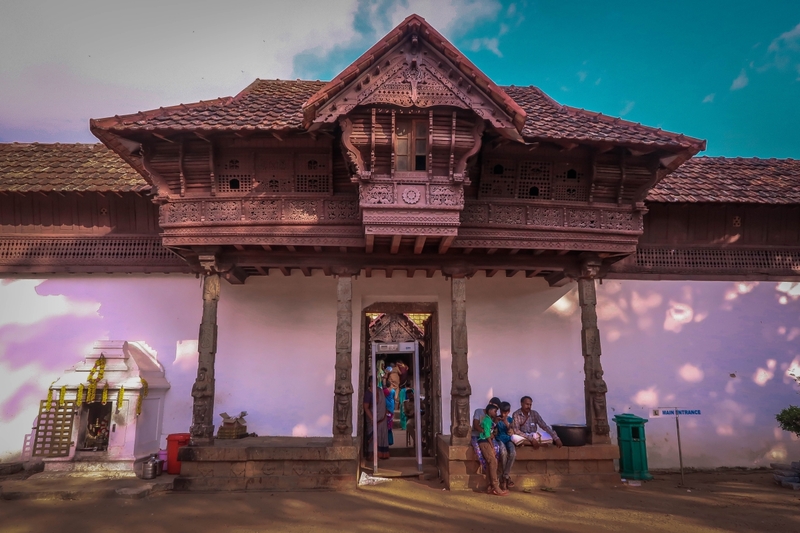 Padmanabhapuram Palace is a bundle of surprises wrapped in wooden layers with intricate design carvings. To begin with, the palace is located in Kanyakumari district of Tamil Nadu. But it is owned and maintained by the government of Kerala. Isn’t it a little weird? 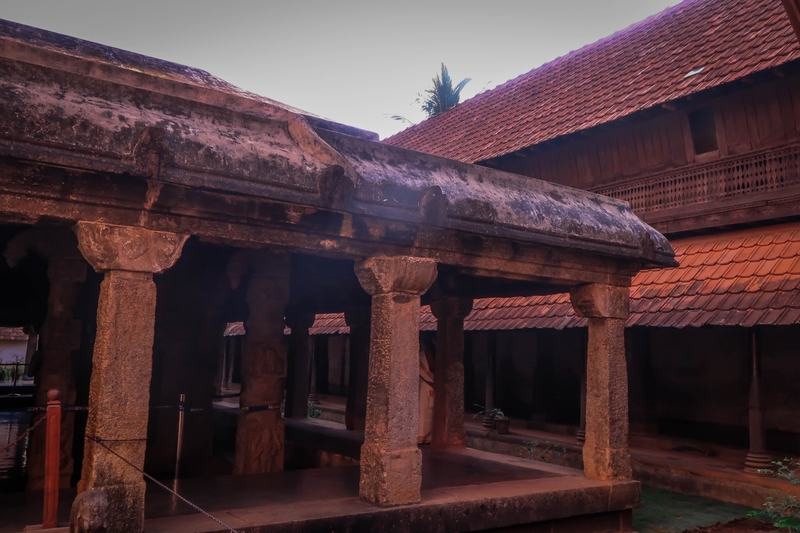 On my South India sojourn, I did a pit stop at Padmanabhapuram Palace while I was on my way to Kanyakumari. The palace is worth every bit of the trouble that I took to reach there. 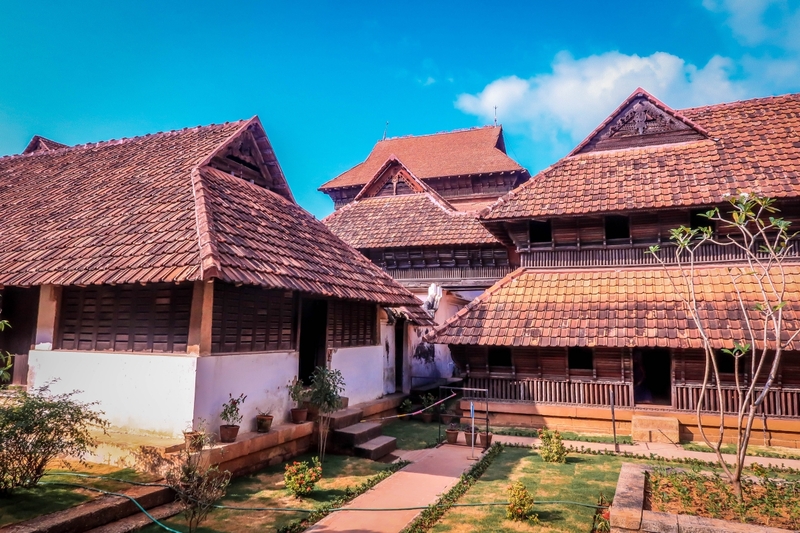 Around 65 kilometres from Thiruvananthapuram, Padmanabhapuram Palace, with its indigenous Kerala architecture, royally transports you to the era of Travancore kingdom. 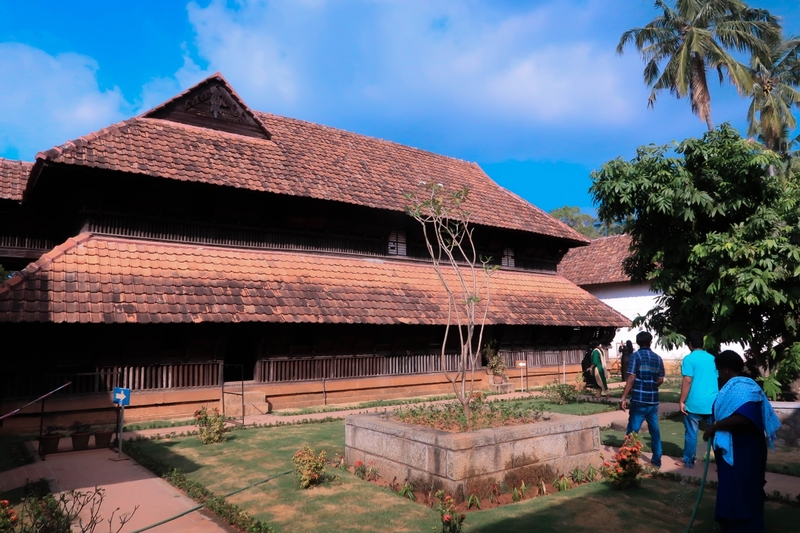 Padmanabhapuram Palace showcases the seat of all the erstwhile rulers of Travancore. The palace easily manages to transfix your gaze to its grandeur. 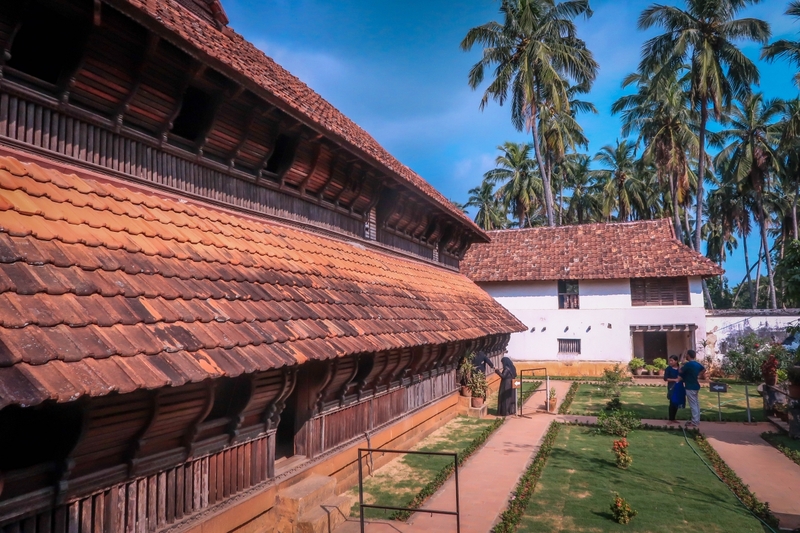 What’s going to surprise you next is the fact that it is a complete wooden palace. Yes, you heard me right, it’s a wooden palace. Wood, something which is susceptible to rain, mites, wind and possibly every other weather adversities. 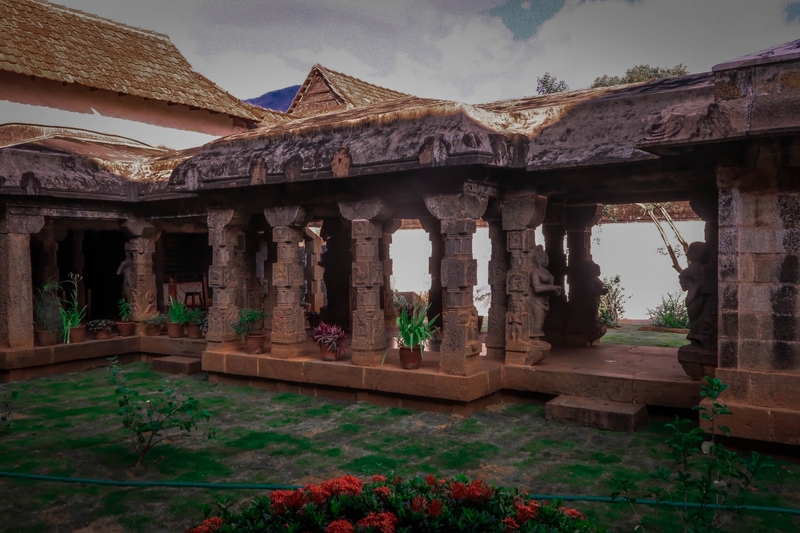 But here is Padmanabhapuram Palace, standing tall and beautiful without any major structural issues. At the entrance of the palace, there is a huge conch made of grass. As Lord Sree Padmanabha is the kingdom deity, a right swelled conch is the emblem of Travancore Kingdom. You can also see it on the flag of the kingdom. 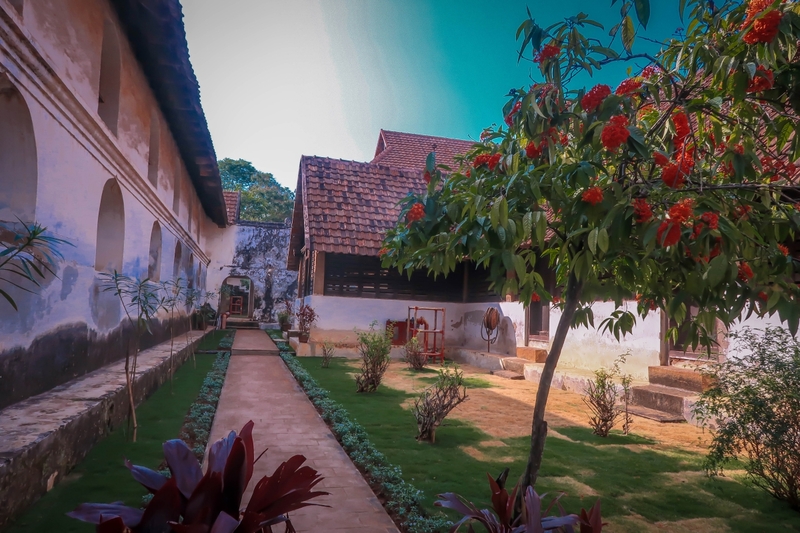 As you set your foot inside the palace, you will find yourself standing in a different era. Purely because I cannot imagine such a palace to be made in today’s time. There is a specific trail that you have to follow when inside the palace. And there are people in every section to enlighten you with the trivia about it. So if you felt like clicking some pictures, stop and take it then and there. Because once the trail finishes you will be outside the palace. What took me to the other level of amazement was the squeaky clean and shiny black granite floors of the palace. If you gaze hard you could see your reflection on the floor. I understood why we were asked to enter the palace barefoot. 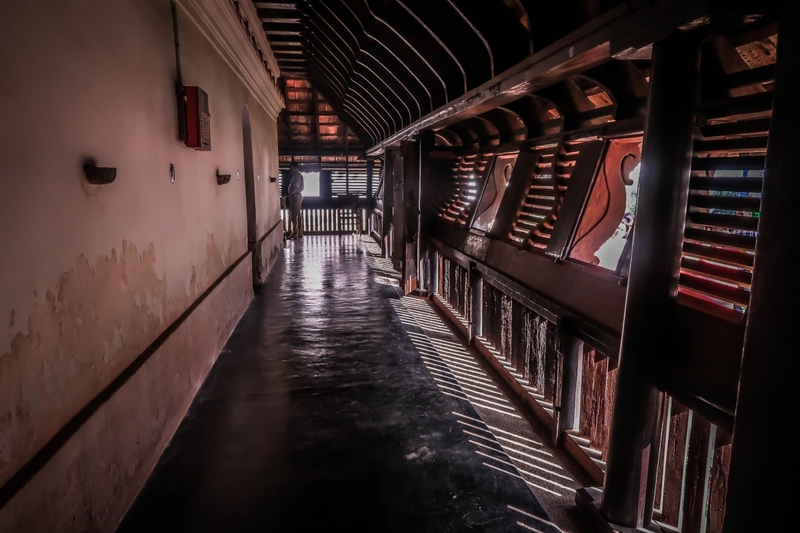 A walk into the palace will make you go through the main room, the kitchen, the Durban hall, the dining area (for guests as well as royalty), the performance hall, the bedrooms and many more then significant aspects of the palace. It is beyond my imagination as to how the architects of that time could come up something so comprehensive. 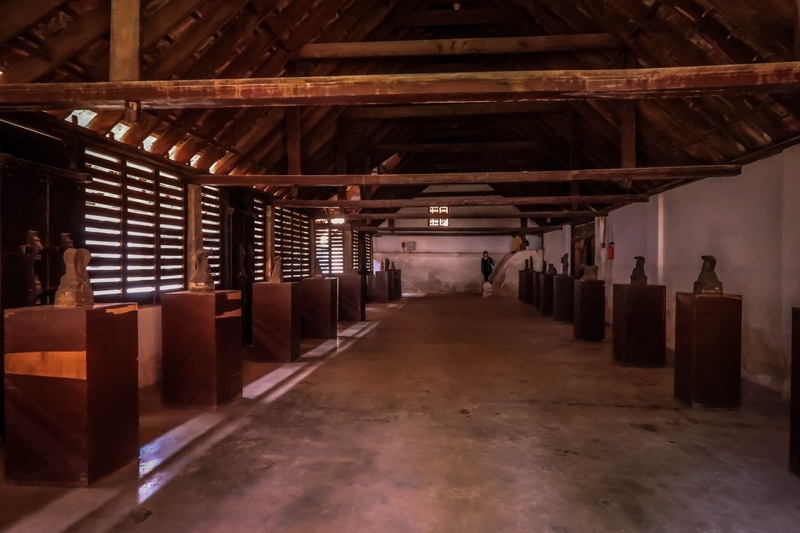 A palace which has all the sections strategically places so as to help with daily chores. The dining hall is close to the kitchen so that carrying the food takes less time. The attention to details in the murals, the colours of the ceiling, the fish and rose carvings are impeccable. 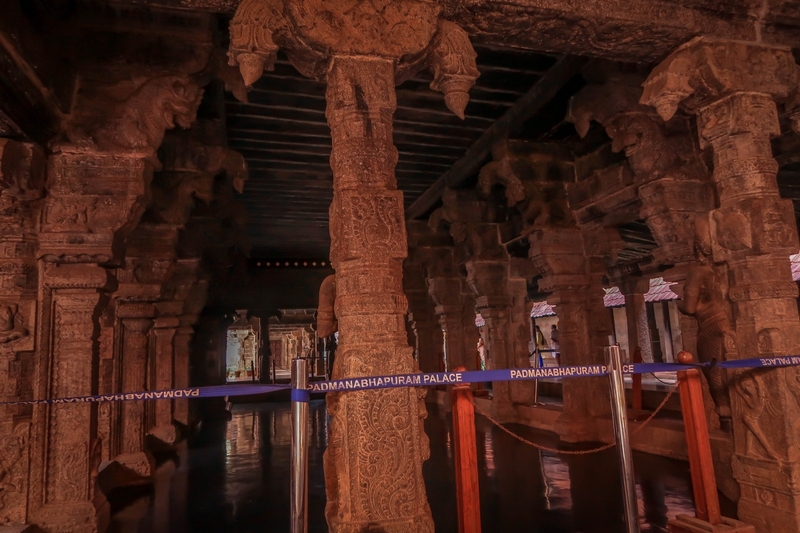 It is also believed that there is a secret underground tunnel which connects the palace to Vattakottai Fort. Vottakotai Fort in Kanyakumari was built by the Travancore kingdom for coastal defence purposes. Although, the majority of the palace is empty, there are few items which are preserved very well. 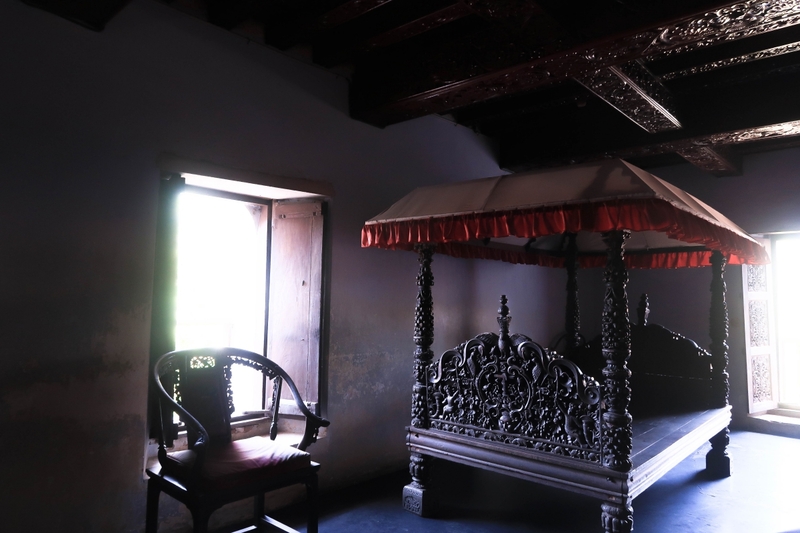 For instance, the King’s bedroom has a famous medicinal bed, a lot of pictures of Lord Krishna, musical bows, royal chairs etc. The palace broadly has five important sections. 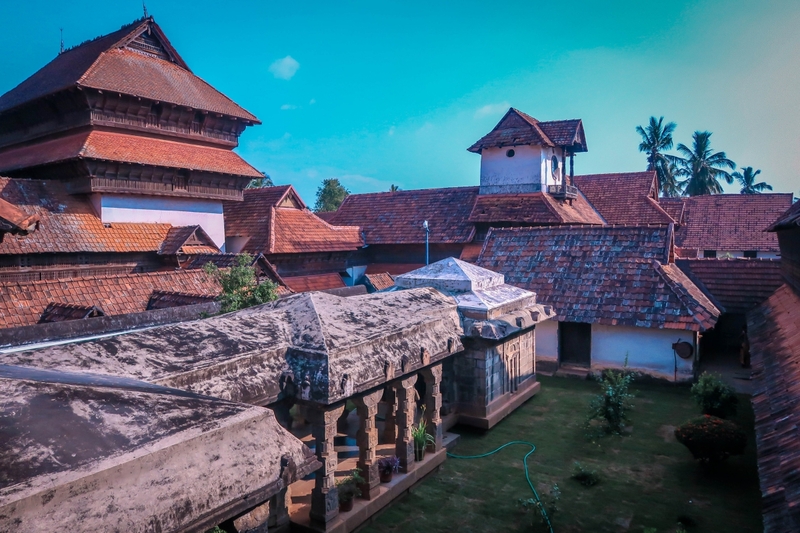 The King’s Council Chamber, the Queen Mother’s Palace, Nataksala; the Performance Hall, Central Mansion and Thekee Kottaram, also known as the Southern Palace. The Council chamber easily stands out with its colourful mica windows, intricate latticework and shiny black floors. 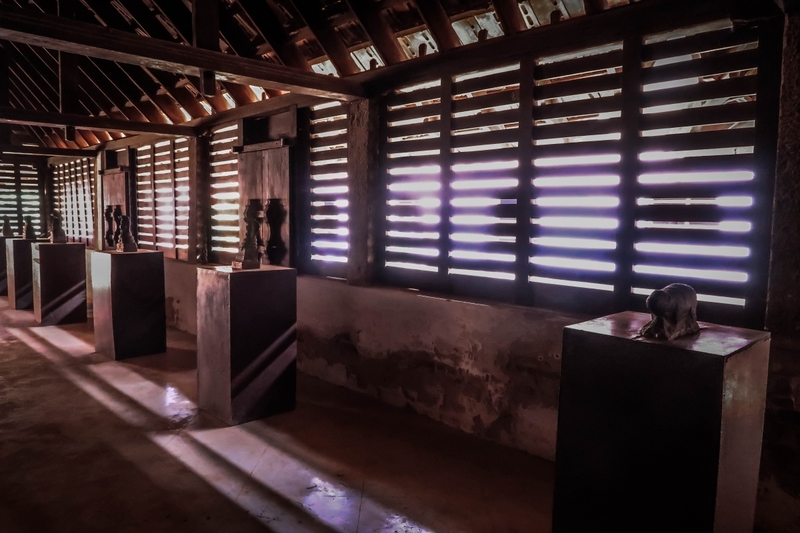 I was told that the floor is made of burnt coconut shells, egg white, jaggery, lime, charcoal and river sand. An interesting concoction that I had never heard before. 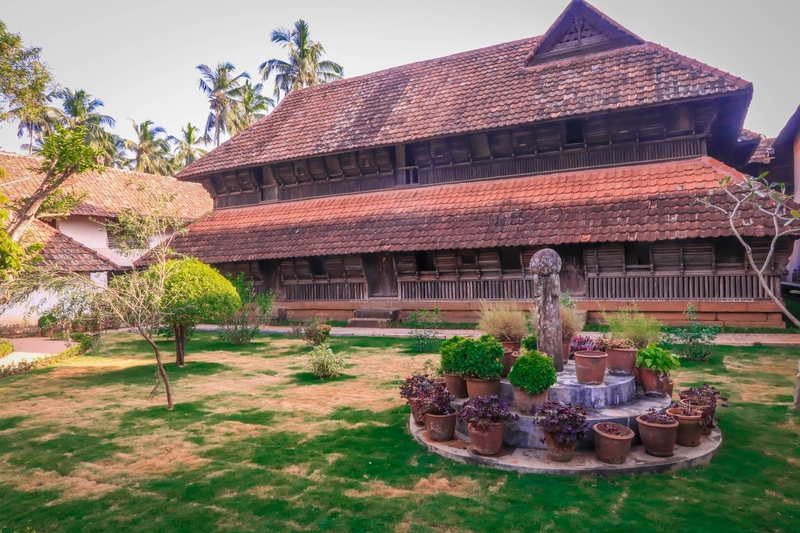 The Queen Mother’s Palace showcases traditional Kerala architecture style. It has an inner courtyard with soloing roofs and pillars on all four corners to support the roof. Basically, all things screaming quintessential Kerala. Nataksala is a relatively early addition to the palace, it wasn’t there since the beginning. 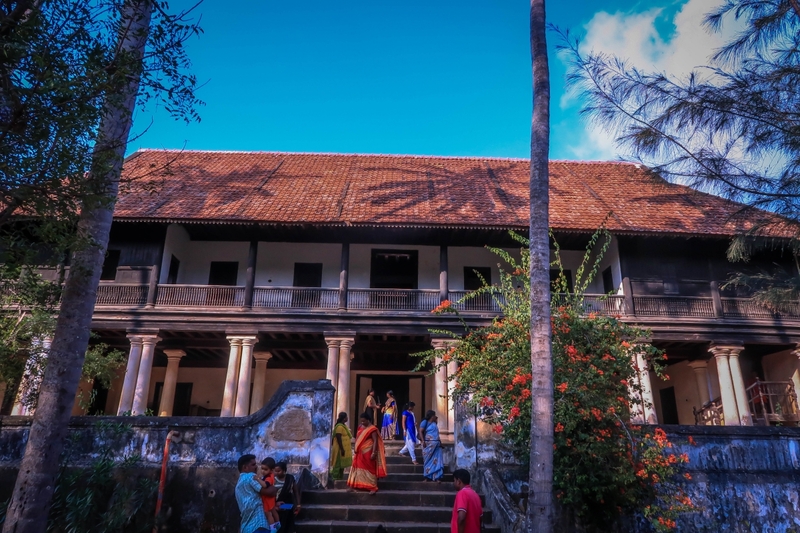 It was built by one of the Travancore kings with great interest in art, music and dance. The main hall has many pillars and shiny black floor. 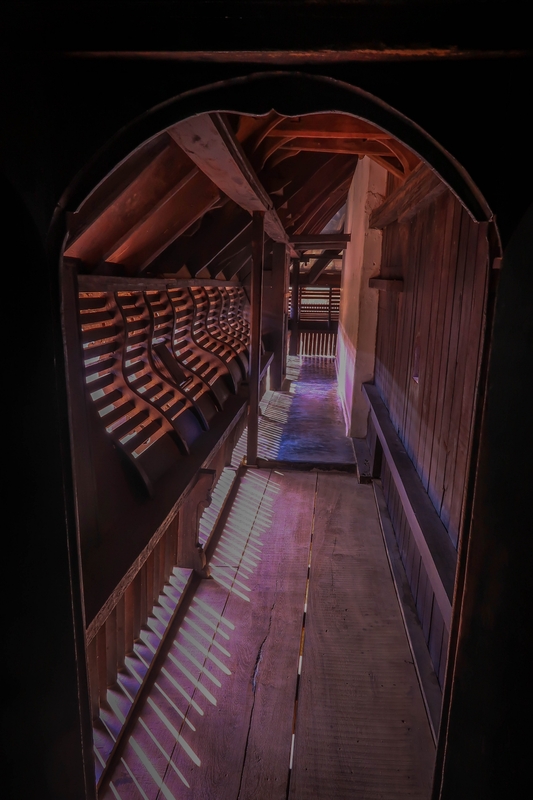 What makes this part interesting is a wooden chamber with peepholes. 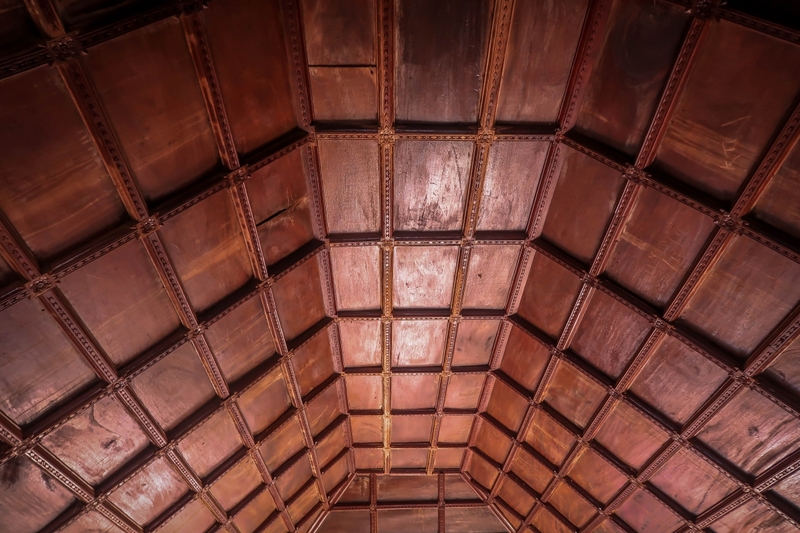 This chamber is for women of royalty to watch the performances. I find it a little depressing that, at that time also women were behind the doors. There could be reasons for such an arrangement but looking at the current scenario I feel women empowerment should have started a long time ago. 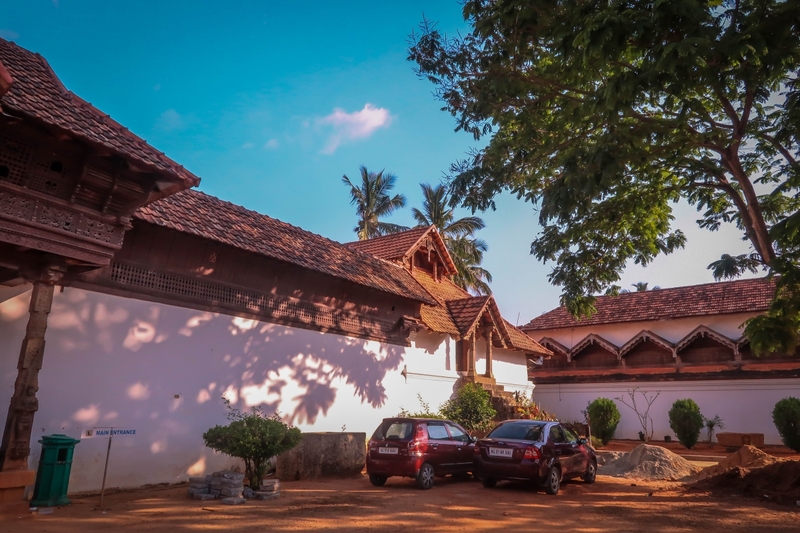 The Central Mansion is a four-storeyed building and true to its name it is located in the centre of the Padmanabhapuram Palace. 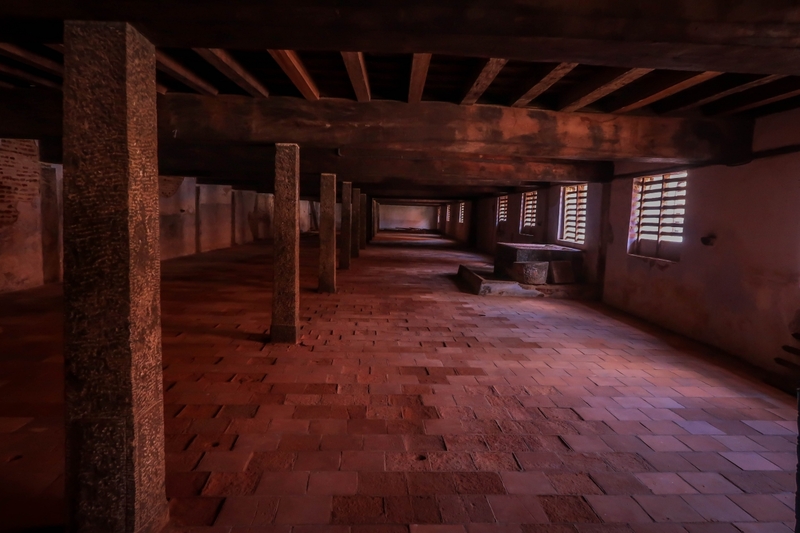 The ground floor is for the storage of royal treasury. 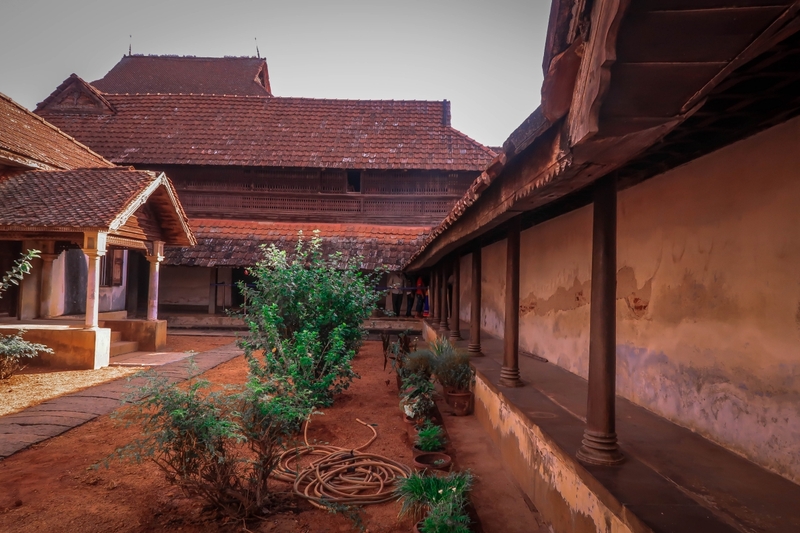 The first floor houses the most interesting and most talked about medicinal bed of the king. The second floor has rooms for studying and relaxing purposes and the top floor is for worshipping the God and Goddesses. The Southern Palace is actually a heritage museum. It houses unique household articles, idols, scripts and other excavated items. 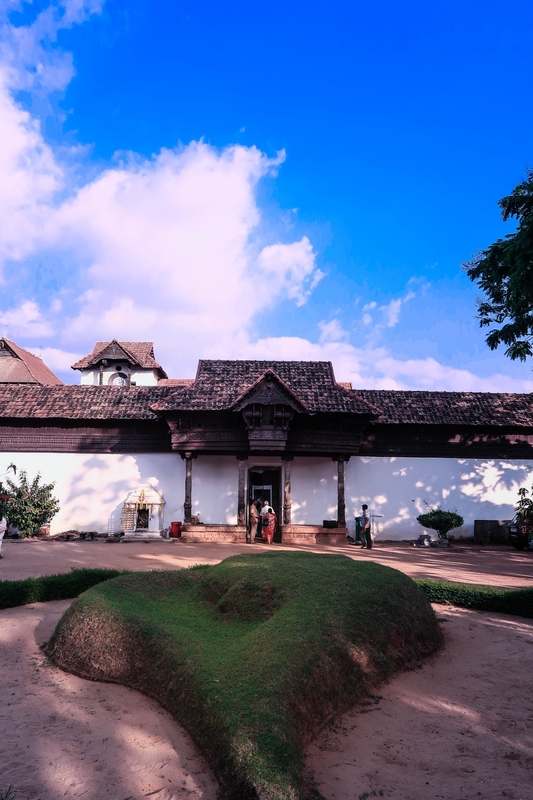 Padmanabhapuram Palace takes you on a joy ride and gives you a glimpse of the social and cultural life of Travancore kingdom. 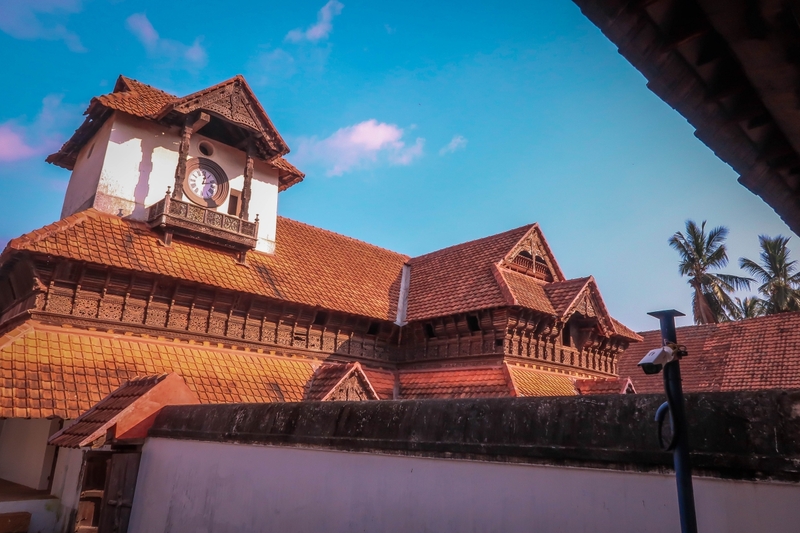 The palace embodies the lifestyle of the Travancore era and you cannot help but wide open your eyes with its architectural marvel. If not anything, the fact that the wooden palace still stands tall will amaze you beyond levels. 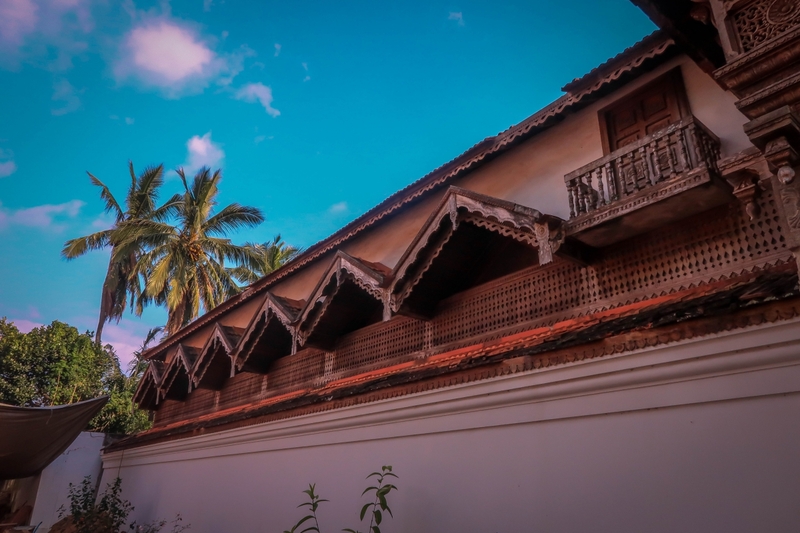 If you are in Trivandrum, take a day out for this full of surprises tryst with the Travancore era. The palace is open all days except Monday and national holidays from 9:00 am to 5:00 pm. Entry fee of Rs. 25 is applicable for Indian Citizen. You will have to take off your footwear and there is a nominal fee for using the stand to keep your footwear. 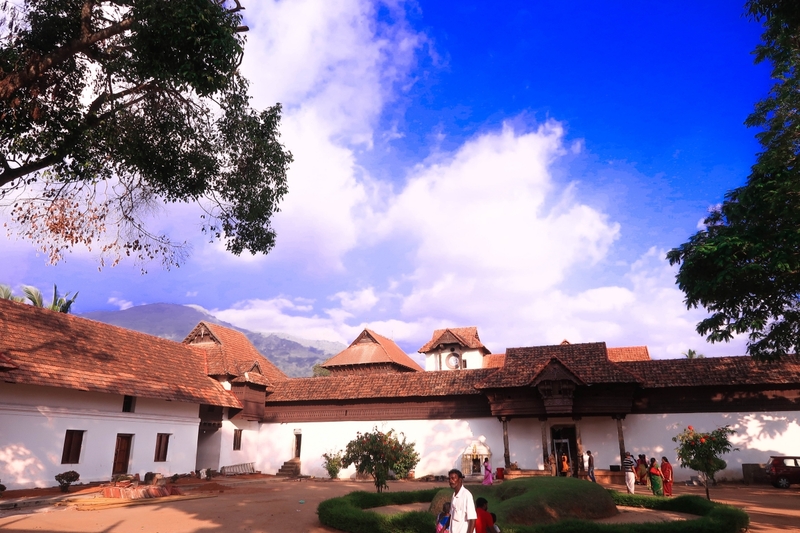 If you are driving to Kanyakumari from Trivandrum then Padmanabhapuram Palace will fall right into your route. So keep an eye on the Google maps for the correct location. There are no guides inside, however, there are people in every section of the palace telling titbits about the palace. If you wish for detailed information on the palace then you can hire a guide outside and take him along. Women were quite empowered if you look at all the royal families of Kerala in those days. It was often the oldest woman in the house that would even choose the next king. Women had separate palaces where the men were not allowed inside. Such was the matriarchal power in the society even in those days. So to say women were behind doors is quite inappropriate. You should read about Sethu Lakshmi Bay to get more of an idea. It’s a palace from the north India palaces I have visited. Every palace I have visited till now had a beautiful architecture but I haven’t visited anything like this. I am hoping to visit this soon. When I Did Paragliding In Bir !